Yum yum! Time for another Gooseberry Patch Cookbook Giveaway and tasty recipes for you to try. The newest soon-to-be released cookbook is 101 Hearty Recipes. As you just read there are 101 recipes but what is most important is that EACH recipe has a photo. I'm a huge fan of this fairly new line from Gooseberry Patch because I'm such a visual person I love seeing the mouth-watering photos which inspire me to cook, cook and cook more! I've already made quite a few of these recipes and they are yummy! Here are two of them for today with more to come. Sprinkle both sides of fillets with salt and pepper. In a skillet, cook salmon in oil over medium heat for 10-15 min. until fish flakes easily with a fork. Meanwhile, combine water, vinegar, lemon juice and brown sugar in a small saucepan. Bring to a boil, cook until liquid is reduced to about 1/3 cup. Serve over salmon. Serves 4. Kitchen Note: I thought I had salmon at home but didn't so I used tilapia instead. The cook time is much less. The sauce is wonderful with tilapia, too. This is a very quick and easy recipe. Toss together vegetables in a large serving bowl; set aside. Combine remaining ingredients; pour over vegetables. Refrigerate until ready to serve. Toss before serving. Makes 8-10 servings. Kitchen Note: To make this even quicker purchase a large cole slaw in the salad aisle instead of chopping the green and read cabbage and the carrot. So quick and very tasty. I loved taking this to an outdoor picnic because their isn't any dairy products to spoil. Read more to enter giveaway. Fill out the new easy Rafflecopter form! I love making chicken pot pie for my family. Very hearty! I went to their website. I'm still looking at it actually. :) I'm reading the free recipes. My hearty recipe is for Lamb Stew. It is a recipe that I developed and my Australian in-laws love it. One of my favorite hearty meals is chicken and dumplings, too. Mine are made with a drop biscuit dough dropped by spoonfuls into simmering chicken broth. Cook 10 minutes uncovered, then 10 minutes covered. Mmmmm. Fluffy dumplings and gravy-style broth. I visited GBP and found out that Sunday is Friendship Day and they suggested Berry and Sweet dish for celebrating! Visited GBP and was interested to see they have a cookbook of the week. I need to check back with them more frequently! I so wanted to enter because I LOVE Gooseberry Patch & have collected everything GBP since their beginning. Unfortunately, I cannot use the rafflecopter from my phone. And my phone is the only way I have access to internet. I folllw you through GFC. I fixed the slaw yesterday. We had it for dinner tonight and they family loved it!!! I am also a fan of yours on fb. 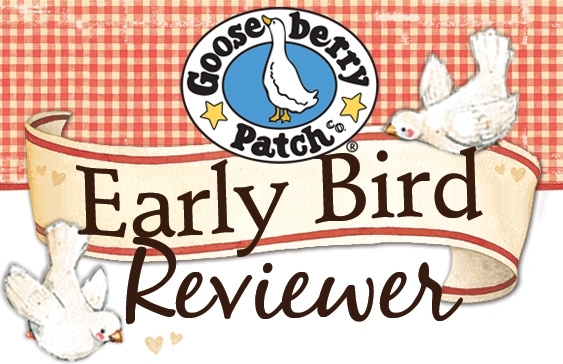 I love everything that is Gooseberry Patch and I finally had a memory published in the new "Quick and Easy Christmas"!! I love chicken pot pie - it's a good, hearty, filling comfort food! I make a pork chop dish my whole family goes gaga for. I marinate the pork chops then sear them in cast iron. I make a sauce of white wine, broth, dijon mustard, scallions, LOTS of garlic, whole vidalia onion,butter, salt and pepper. Then I let the pork chops cook in the sauce on a low flame for about 40 minutes to an hour. They are sooooooo yummy. WE usually do it with crusty bread to dip into the sauce. Great with rice or buttered noodles. fortunately I live in Texas so we didn't feel anything of the earthquake today. Our prayers are with the ones who did. Oh how I wish I had the opportunity to check out this book with a hot cup of tea and a warm bath. Thanx for hosting such a terrific giveaway. I checked out your preview post and left a comment. Really want to make the fried dill pickles recipe! Also thank you so much for voting for me!!! My fav hearty recipes are usually casseroles. Anything with a meat, starch, veggies and usually topped with some cheese. You just can't go wrong! Will love to get my hands on that Quick & Easy Christmas book. That BIG book is going to be AWESOME! Thanks for the 10 extra points! did u read their tip of the week? if not, here it is: A little red wagon makes a great carry-all for any outdoor gathering. Fill it with crushed ice and bottles of soda, water and juice boxes. I enjoy a Hearty Beef Stew.. I love gooseberry and ur site too!